Dwight School Seoul located in Digital Media City, Mapo-gu, believes the key to academic success is igniting every student’s passion for learning and providing personalized learning opportunities for each student, the school said Wednesday. As an International Baccalaureate World School, Dwight School Seoul provides international education based on the highest recognized academic standards and uses the IB curriculum to kindle every child’s personal interests, helping students become inquisitive, informed, self-aware and ethical citizens. In the Primary Years Program, or PYP, for age 3 to grade five, teachers harness students’ natural curiosity about the world for their academic experiences. Students get to choose topics they are passionate about and delve deeply into those topics. In the Middle Years Program, MYP, for grades six to 10, a student might partner with a medical researcher for a rare mentorship in the sciences or get one-on-one tutorials to help overcome a particular academic challenge. In the Diploma Program, DP, for grades 11 and 12, a student might volunteer in an orphanage in Nepal for a week for a project in sociology or develop and build a touchscreen remote control for a drone in product design. As a student grows up in the challenging, comprehensive IB program, proceeding from PYP to MYP to DP, teachers and mentors help students find their “spark of genius” and that lights the way to developing the independence and critical thinking skills that are demanded in university and today’s globally competitive workplace. The IB Diploma Program -- internationally known as the “gold standard” in university preparation -- is the only curriculum where students all around the world are measured with the same academic benchmarks. Graduates of the Diploma Program at Dwight School Seoul continue to outperform their peers around the world. In 2017, 73 percent of Dwight students achieved a higher score than the average score worldwide. And 50 percent of Dwight candidates earned bilingual diplomas, taking the exams in two languages at mother tongue-level, compared to only 28 percent of total candidates around the world. Located on a 200,000-square-foot, state-of-the-art campus, Dwight School Seoul was named the Best Foreign and IB World School in The Korea Herald Readers’ Survey Best Brands 2016. Dwight School Seoul is a member of The Dwight Schools, a global network of educational institutions committed to the philosophy of International Baccalaureate education. Through the curricula, students are taught to engage with global challenges through inquiry, action, and reflection. 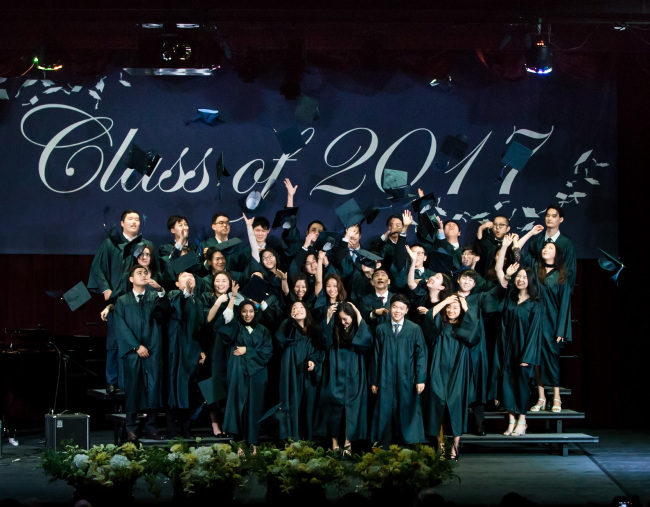 Graduates of Dwight School Seoul have gained admittance to many of the world’s leading colleges and universities including Columbia University, UCLA, Williams College, New York University, McGill University, University of Toronto, University College London, and the University of Edinburgh. Dwight School Seoul is on a rolling admissions schedule and applications are accepted all year.